Despite some complicated customization software, the R.A.T. TE checks all the boxes, making it one of the best featherweight gaming mice I've ever used. Whoever came up with the phrase "looks can be deceiving" probably didn't know about Mad Catz's R.A.T. line of mice. If they did, though, that probably would've given their newly uttered idiom a run for its money. Despite its garish appearance, the wired, $79 (about £49, AU$90) Mad Catz R.A.T. Tournament Edition – the latest in the line of the Transformer-looking gaming mice from Mad Catz – is actually a pretty darn good pointer. Mad Catz refined its leading peripheral by taking a few steps back. The R.A.T. TE is less customizable than the Mad Catz Cyborg R.A.T. 9 and has fewer interchangeable parts than 2010's Mad Catz Cyborg R.A.T. 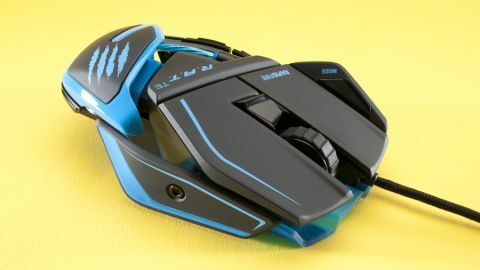 7 (read: none), but by dropping the non-essentials and improving in the areas that matter, Mad Catz crafted an approachable mouse that novices and pros alike can enjoy. A hallmark of the brand, the R.A.T. series look like it's one intense firefight from falling apart. It is, in truth, anything but. The mouse is made entirely of light blue and black hard plastic that's fused together in every which way. This design, like its predecessors, is polarizing. I know gamers who love the cobbled together aesthetic and others who, out of sheer confusion, wouldn't know what to do with it. And if finding the gaming mouse of perfect length has been a pain in the past, don't expect it to be a problem here. The palm rest extends roughly two inches and can adjust to fit most hand sizes. Problematically, placing any pressure on the palm rest when it's fully extended actually lifts the mouse into the air. It's disproportionately light. The front half of the mouse is the heavier side, while the back contributes almost nothing to the device's measly 90g heft. Moving past the palm rest, the plastic shoulder located on the left side hosts two programmable macro buttons and a circular dpi shift button that acts as a quick way to drop down to a low sensitivity. These buttons were both well developed and perfectly placed – not too far that they were out of reach, but not so close that I was accidentally activating them during day-to-day use. Angular left and right-click buttons dominate the front of the mouse, while a mode button, scroll wheel and profile switch key get tucked away in familiar spots. Speaking of modes, customizing each mode setup using Mad Catz's desktop app, while tedious at first, opens the way for a slew of great experiences. It's rare that I use every macro mode available, but the three on-board profile options allowed me set up a high sensitivity setting (nowhere near the TE's maximum of 8,200 dpi), a low sensitivity setting, and one optimized for my office mousepad – a SteelSeries QcK. Using the app to create said custom macros, however, is a trial in patience. Mapping each of the four macro buttons is done by dragging and dropping commonly used commands – things like ctrl+N, volume up and down, play/pause, and next track – onto its corresponding spot on the mouse. If you're feeling up to it, you can create a custom macro via keyboard inputs and assign those spots as well. Other tabs allow you to raise or lower the lift-off height, toy with sensor damping (something crucial for cloth mouse pad users) and mess around with the dpi levels. The one problem I ran into while testing the software was that, after restarting the computer, the software reset my profiles without warning, sending me to the default settings and erasing all of my hard work. Even if you can look past the occasional bug, the software feels haphazard. It's simply not as cleanly designed as Logitech's Gaming Software or as intelligent as the SteelSeries Engine 3. The Mad Catz R.A.T. TE isn't perfect. The software isn't the most intuitive or reliable, and the extendable palm grip, while convenient for gamers with larger hands, can lead to some frustrating issues. However, the most polarizing aspect of this gaming mouse is its design. Mad Catz broke the mold of unibody mice, and its latest iteration of the R.A.T. line is a bold combination of bright blue and matte black. Regardless of which side you fall on regarding this mouse's design, Mad Catz has crafted quite the comfy wired pointer for just $80. If you're tired of the same ol' routine in your peripherals, the R.A.T. TE is one of the best options around today.